Los Angeles police Chief Charlie Beck and the Police Department’s independent watchdog have determined that two officers were justified in fatally shooting Ezell Ford, a mentally ill black man whose killing last year sparked protests and debate over the use of deadly force by police, according to sources with knowledge of the investigation. Department investigators found evidence indicating that Ford had fought for control of one officer’s gun, bolstering claims the officers made after the shooting, said two sources who spoke on the condition that they not be identified because they were not authorized to publicly discuss the case. Ford and one of the officers, Sharlton Wampler, had scratches on their hands, and the holster for Wampler’s gun was scratched as well, the sources said. Tests found Ford’s DNA on the weapon, according to the sources. The shooting occurred Aug. 11, after Wampler and his partner, Antonio Villegas, members of an anti-gang unit in the department’s Newton Division, saw Ford walking down a street near his South L.A. home. Alex Bustamante, the Los Angeles Police Department’s inspector general, found the shooting justified, but he faulted the officers for how they approached Ford in the moments leading up to the shooting, according to the sources. LAPD officials have never offered an explanation for why the officers stopped the 25-year-old Ford, but the sources said that the officers told investigators they decided to detain him because they believed Ford was trying to discard narcotics as he walked. The department has never publicly said whether narcotics were found. Bustamante concluded in his report to the Police Commission that it was unclear whether the officers’ observations were sufficient justification to approach Ford and then try to detain him, the sources said. And as the officers reached Ford, Wampler put his hands on him — a move that Bustamante found unacceptable. Department protocols instruct officers in such situations to address a suspect from a position of safety, such as behind an open car door. Ford’s death became a local rallying cry against killings by police, particularly those of black men. Ford, who had been diagnosed with bipolar disorder and schizophrenia, died two days after the fatal police shooting of Michael Brown in Ferguson, Mo., which prompted nationwide demonstrations and a heated conversation about race and policing. Ford was one of 18 people killed and nine others wounded in LAPD shootings last year, the department said. As of Monday, police officers had shot and killed eight people and wounded another eight so far this year, the department said. The Police Commission, a civilian panel that oversees the LAPD and makes the final ruling on all serious uses of force by officers, is scheduled to discuss the shooting in private on Tuesday after its weekly public meeting. As with all shootings, the commissioners will determine whether the officers’ decisions to draw their weapons and then use deadly force fell within department policies. The board also will rule on whether the tactics the officers used throughout the encounter were acceptable. Beck, according to the sources, will recommend to the commission that the officers be cleared in all three categories, while Bustamante, whose office conducted its own investigation of the shooting, will recommend the board fault the officers for their tactics. If the commission follows Bustamante’s recommendation, it would then be up to Beck to decide what discipline, if any, to impose. Often when an officer’s decision to use deadly force is found to be justified but the tactics flawed, Beck opts to order the officer to undergo retraining instead of handing down a punishment. Bustamante and Cmdr. Andrew Smith, an LAPD spokesman, declined to comment, saying it would be inappropriate to discuss the shooting before the commission issues a ruling . The two officers involved in the shooting are assigned to administrative duties, Smith said. Last year, Beck offered a brief account of the shooting. The officers, he said, told department investigators that they shot Ford during a violent struggle in which Ford forced one officer to the ground and grabbed his gun. The officer reportedly yelled for help, Beck said, prompting his partner to fire at Ford. The officer on the ground used a backup weapon to reach around Ford’s body and shoot him in the back. An autopsy showed Ford was shot three times, including once so closely in the back that the muzzle of the officer’s gun left an imprint. Ford’s mother was emotional when she learned of the department’s and inspector general’s recommendations Friday from a Times reporter. She said that she shared the same concerns as the inspector general over the officers’ decision to stop her son, and that she wanted the U.S. Justice Department to investigate her son’s death. The officers’ attorney, Larry Hanna, said his clients had little choice but to make contact with Ford when they saw him turn away and appear to conceal something. “I’m hoping the commissioners will see it was within policy,” he said. Craig Lally, president of the union that represents rank-and-file officers, declined to comment on the officers’ tactics prior to the shooting, saying he did not know all of the facts. But he defended their use of deadly force, saying the situation escalated when Ford grabbed Wampler’s gun. “The only reason you try to take a gun away from an officer is to use it against the officer or use it against somebody else,” Lally said. “Had that person not escalated to try and get the gun away from the officer, this would be a non-event in everybody’s life. The suspect dictated what happened in this. 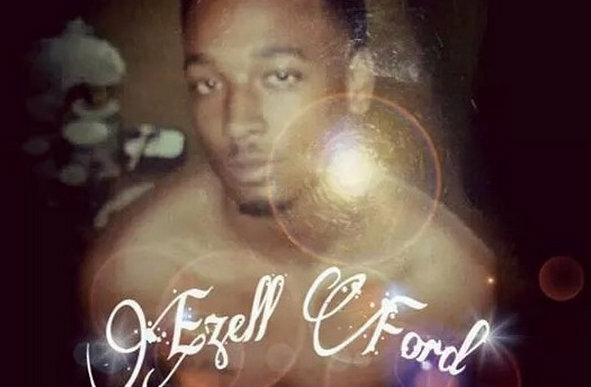 The official autopsy report for Ezell Ford, an unarmed, mentally ill black man shot to death by Los Angeles police in August, was released by the county coroner’s office Monday after the Los Angeles Police Department lifted an investigative hold that had blocked the report from public view for over four months. The coroner’s investigation ruled Ford’s death a homicide by multiple gunshot wounds. Ford, 25, was killed by LAPD officers Sharlton Wampler and Antonio Villegas, both on gang enforcement detail, shortly after 8 p.m. on Aug. 11 in the Florence neighborhood of South LA. The report provides the first detailed account from authorities of his injuries. 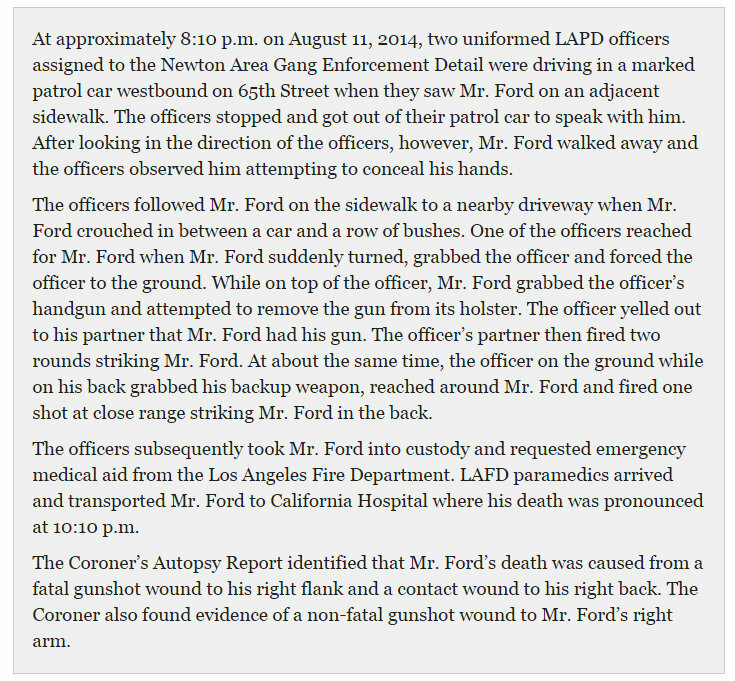 According to the autopsy report, Ford, was shot three times, resulting in two fatal wounds and one nonfatal. The skin around the fatal wound in Ford’s back had a “muzzle imprint,” which suggests that the shot was taken at close range. The second fatal wound was in Ford’s side abdomen. A third wound, ruled nonfatal by the coroner’s investigation, was on his right arm. “An autopsy does not prescribe motivation or indicate propriety — in this case, is it a legal killing or not,” LAPD Chief Charlie Beck said in a press conference later on Monday. “There is nothing in the coroner’s report that is inconsistent with the officers’ accounts,” Beck said, but added that the investigation is still incomplete. A trace amount of marijuana was also found in Ford’s system, according to a toxicology report. Because THC, the active ingredient in marijuana, can linger in the human body, however, its presence does not mean that Ford was intoxicated at the time of his death. The release of the Ford autopsy comes at a tense time as protests over police killings have continued in multiple cities around the nation and as two New York City police officers were shot dead in alleged retaliation less than two weeks ago. Ford died just two days after teenager Michael Brown was fatally shot by a Ferguson, Missouri, police officer. The protests over the death of Brown and of Eric Garner, who died after being put in a chokehold by a New York police officer, have also cited Ford. In south LA, people are frustrated and angry. Around the city, there have beenmultiple protests since the Ford shooting. Much like the Brown case, police and eyewitness accounts of Ford’s death vary wildly. The police said that during an “investigative stop,” a struggle ensued in which Ford”turned, grabbed one of the officers.” They “fell to the ground,” police said, and Ford allegedly attempted to pull an officer’s handgun from its holster. The “partner officer then fired his handgun and the officer on the ground fired his backup weapon” at Ford, according to police. “It is unknown if the suspect has any gang affiliations,” the LAPD said in a statement after the killing. That witness also said Ford’s mental state was well-known in the neighborhood. Tritobia Ford, Ezell’s mother, said her son showed signs of schizophrenia and bipolar disorder. Another eyewitness told HuffPost that he heard a police officer shout, “Shoot him!”before Ford was shot three times as he was lying on the ground. Ford was transported to a nearby hospital, where he died. The LAPD said no officers were injured during the incident. On Monday, Earl Ofari Hutchinson, president of the civil rights community forum Los Angeles Urban Policy Roundtable, said in a statement, “The killing of Ford has been ruled a homicide by the coroner, and the bullet wounds in his back give strong indication that he could not have been resisting the officers.” Hutchinson called on LA County District Attorney Jackie Lacey to conduct a “fast track” investigation into possible criminal charges against the two officers involved in the fatal shooting. The Ford autopsy had been under an investigative hold for months in order to prevent witness testimony from being tainted, according to the LAPD. The police department said it hoped that additional witnesses would eventually come forward. In August, Ed Winter, the assistant chief of investigation at the coroner’s office “the hold was indefinite”. But in November, LA Mayor Eric Garcetti ordered the report to be made public before the year’s end. A months-long delay in the release of an official autopsy report is “unusual,”according to the county coroner’s office. 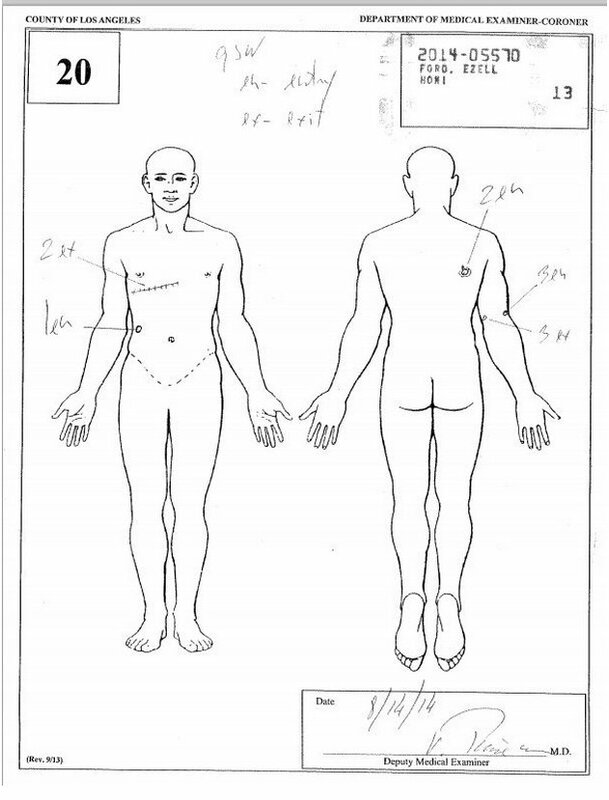 The medical examiner’s report on Brown was released about two months after his death; the report on Garner came out less than a month after his death. In October, the South Central Neighborhood Council unanimously passed a resolution asking Los Angeles City Councilman Curren Price to demand that the release of the autopsy reports for Ford and Omar Abrego, another South LA man who was allegedly beaten to death by LAPD officers about a week before Ford was killed. Steven Lerman, a lawyer for the Ford family, had earlier accused police of withholding the Ford report for “political reasons.” Lerman described the shooting of Ford as “an execution” and has filed a $75 million wrongful death lawsuit for the Ford family. UPDATE: 9-14-14 LAPD Newton Division’s “Gang Enforcement Detail” Officers Sharlton K. Wampler 12 years as an Officer and Antonio Villegas 8 years as an Officer are the cops responsible for shooting Ezell Ford to death in South Los Angeles. Both officers are now on paid vacation. The night before Ford’s life was taken. A witness says these same 2 officers were harassing Ezell, despite knowing he, as one neighbor put it, “wasn’t all there”. Needless to say the cops’ story is disputed. In the words of LeRoy Hill, who saw the entire incident go down, “They had him in the corner and were beating him, busted him up, for what reason I don’t know; he didn’t do nothing… The next thing I know I hear a ‘pow!’ while he’s on the ground. They got the knee on him. And I hear another ‘pow!’ No hesitation. And I hear another ‘pow!’ Three times.” “When Ford’s mother Tritobia Ford rushed to the scene to see what happened, the cops raised their batons at her in an attempt to intimidate her. Not once did they ever try to console her”. Another witness is quite clear of the fact he heard the officer who was pinning Ford to the ground yelling out to the other officer, “Shoot him!” After that, “three bullets were planted in Ford’s back while he was lying on the ground.” Rather tellingly the cops did not have a dash-cam mounted on their patrol vehicle at the time Ford was shot.